Financial results for the quarter ending March 2016 are in and we have tabulated them for you in this report. The report includes all companies with a market cap of more than 1000 cr., and we have divided them into sectors. Till May 14 2016, 192 such companies have announced results with a combined turnover of Rs. 5.67 trillion (lakh cr. ), with a Total Revenue increase of 4.01%. Total Profit has however decreased by 2.03% . We have discounted the effects of outliers (<-400% or >400%) while calculating the average growth rates. 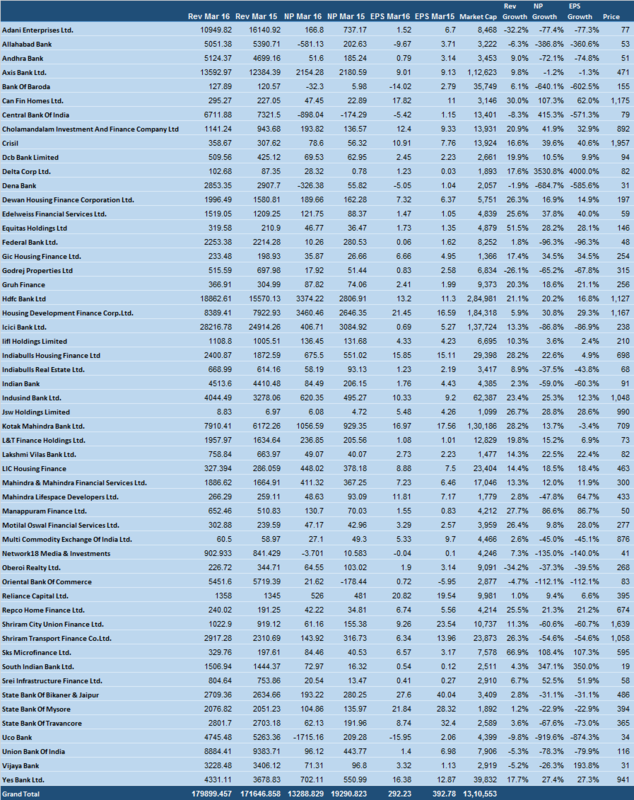 27 companies more than doubled net profit. Capital Mind will update this report regularly and provide a note at Capital Mind Premium when updated. Please feel free to contact us for any corrections or changes. This has been a regular feature at Capital Mind from Q1 FY 2015 onward. • All figures in Rs. Cr. except EPS, which is in rupees. • Only Companies with Market Cap of more than Rs. 1000 cr. • Growth totals are added up for Revenue/Profits, but Averaged for the Annual Growth Percentages. • We used the Global Industry Classification Standard to separate the companies into their sectors. • Where earnings go from profit to loss or vice versa, things go a little crazy with the profit and EPS growth percentages. Please ignore them. 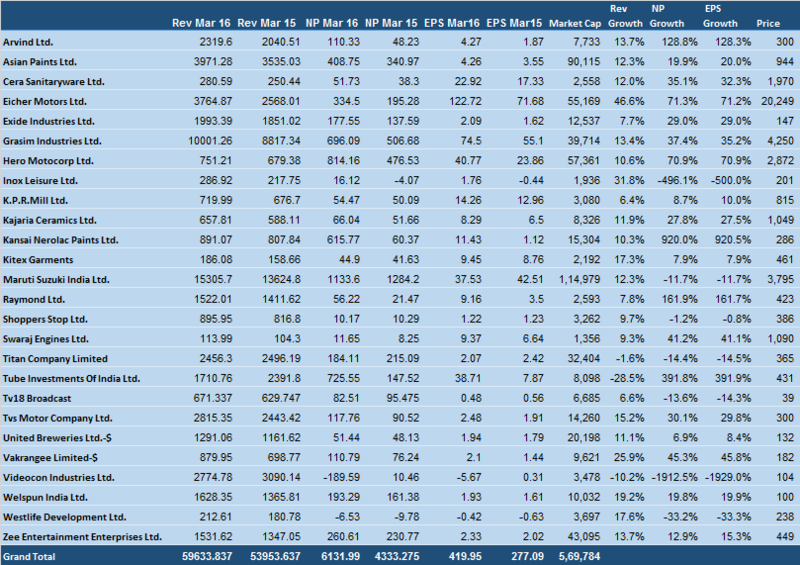 The financial results of 28 Nifty companies are out so far. Total Net Profits of the companies added up, went up by 8.49%. • Tata Consultancy Service was a standout! 72.74% rise in Net Profits, but this was due to a one timer in the March 2015 quarter. 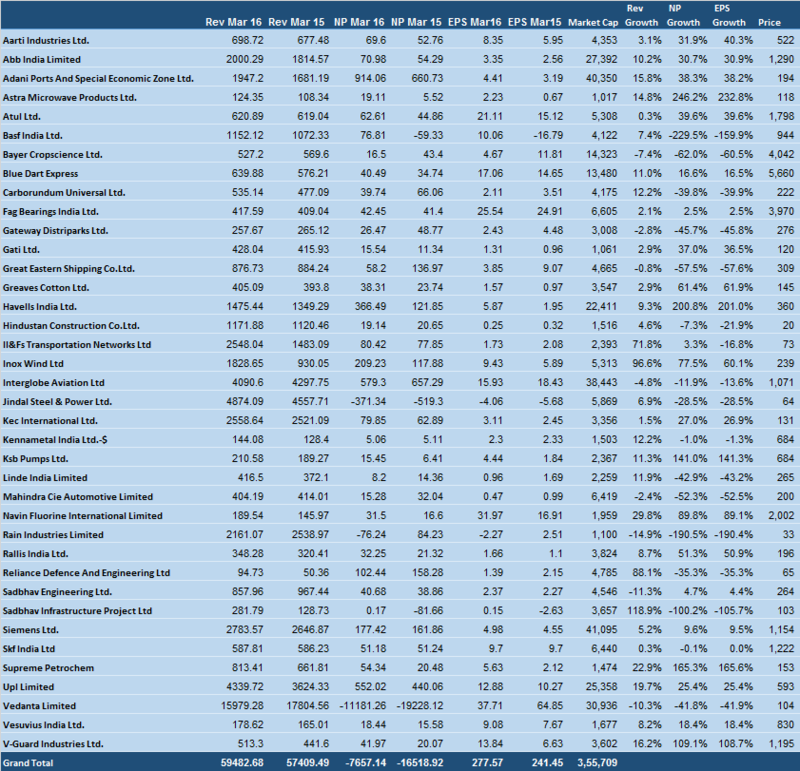 The YoY numbers for TCS are reasonable. • Eicher Motors showed a very impressive 71.3% increase in Profits this quarter as Revenues jumped 46.6%. 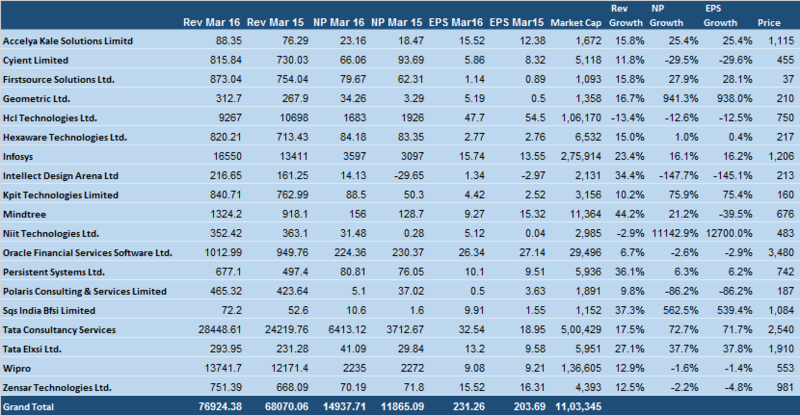 • Hero MotorCorp & Adani Ports both did exceedingly well, clocking 70.9% and 38.3% growths in Profits respectively. • Bank Of Baroda profits declined by a huge margin. • ICICI Bank profits tanked by 86.82% – again due to what they call a one time provision. However time will tell if it’s one time or just a regular thing they’ll have to continue to do. • Dr Reddys laboratories saw Net Profits decline by 85.6%! 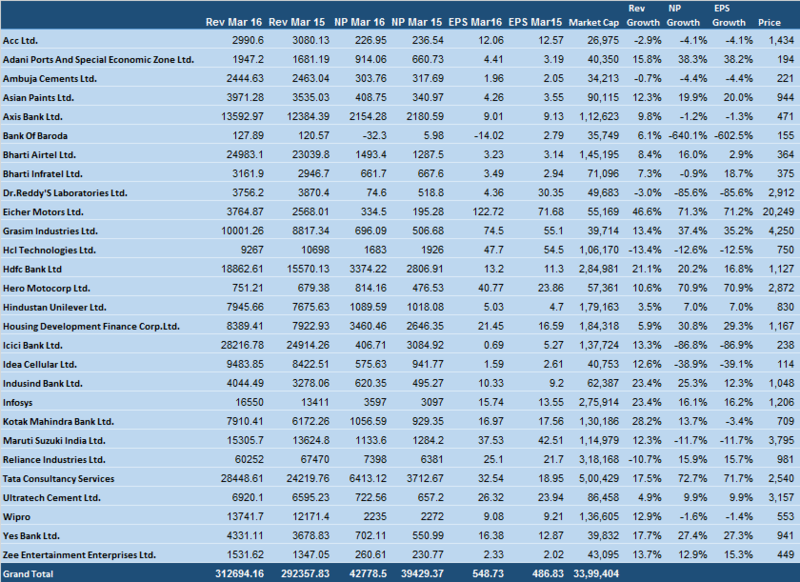 In the table, we have a list of all Nifty companies with results. We’ve used consolidated results where we can, and have adjusted past EPS for bonuses or splits. If we have something wrong, please let us know. (All figures are in Rs. Cr. except Earnings Per Share).